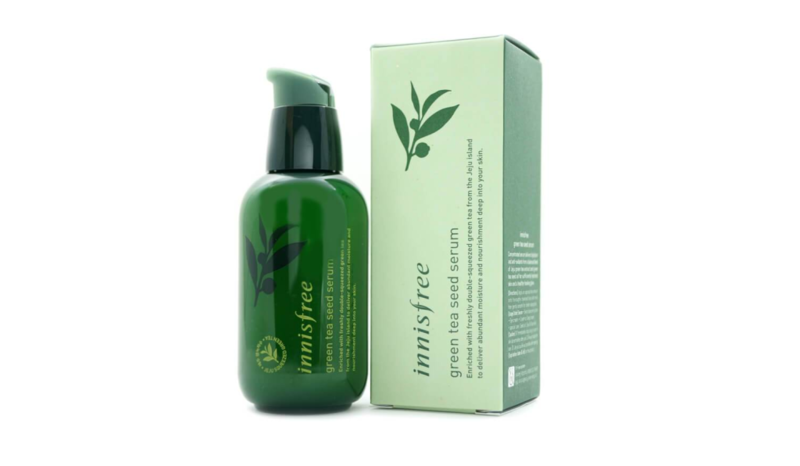 The Innisfree Green Tea Seed Serum is a moisturising and nourishing serum containing eco-friendly Jeju fresh green tea and green tea seeds. It claims to deeply hydrate, delivering clear, dewy skin while strengthening the skin barrier for longer lasting moisturisation. Green Tea is a potent antioxidant that helps neutralise free radicals, reduce inflammation, clear cell damage and repair wrinkles. Rich in Catechins, a group of natural compounds called Polyphenols (EGCG in particular) that protect against UV radiation and environmental stressors, green tea also helps to inhibit collagenase, the enzymes that break the peptide bonds in collagen, thus promoting skin firmness and elasticity. 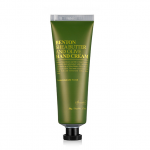 The formulation includes several exotic botanical extracts. Used for hundreds of years medicinally, Prickly Pear Extract is more recently recognized for its skin firming properties and ability to protect, smooth, and moisturize. 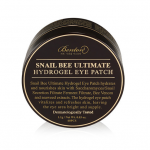 Orchid and Cocoa Extracts contribute protective antioxidants plus condition and soothe skin. Tangerines are rich sources of Vitamins A and C. Vitamin A helps heal and treat skin disorders and irritations such as acne while C provides antioxidant protection. 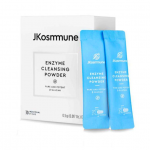 Together these properties help maintain youthful skin. Citrus Extracts of bergamot, grapefruit, orange and tangerine improve antioxidant strength and also contribute antibacterial, antiseptic and anti-inflammatory effects to ward off bacteria and acne as well as enhance the formula’s natural preservative function. Collectively, Cetearyl Olivate and Sorbitan Olivate present a unique natural emulsifier derived from olive oil which reduces water loss and moisturises the skin. There are also other ingredients in the formula that boost this action. 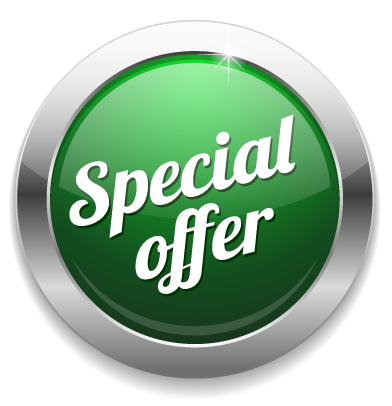 Finally, the serum also contains a significant amount of Ethanol which appears fourth in an ingredient list of 28. Ethanol is considered a bad alcohol, not a fatty one that can impart skin benefits. However, alcohols in formulations increase the speed with which a product dries which can make it feel lighter and more enjoyable to use. As an ingredient, it isn’t harmful, however, the drying effect that is experienced can lead to a weakened epidermal barrier. This results in less protection which increases risk of inflammation and accelerated ageing. 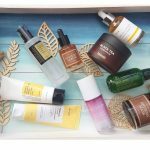 Alcohol helps ingredients like retinol and vitamin C penetrate into the skin more effectively, but it does that by breaking down the skin’s barrier—destroying the very substances that keep your skin healthy over the long term. Furthermore, she states that even though alcohols evaporate quickly, they start a chain reaction of damage immediately upon touching the skin that continues long after evaporation. 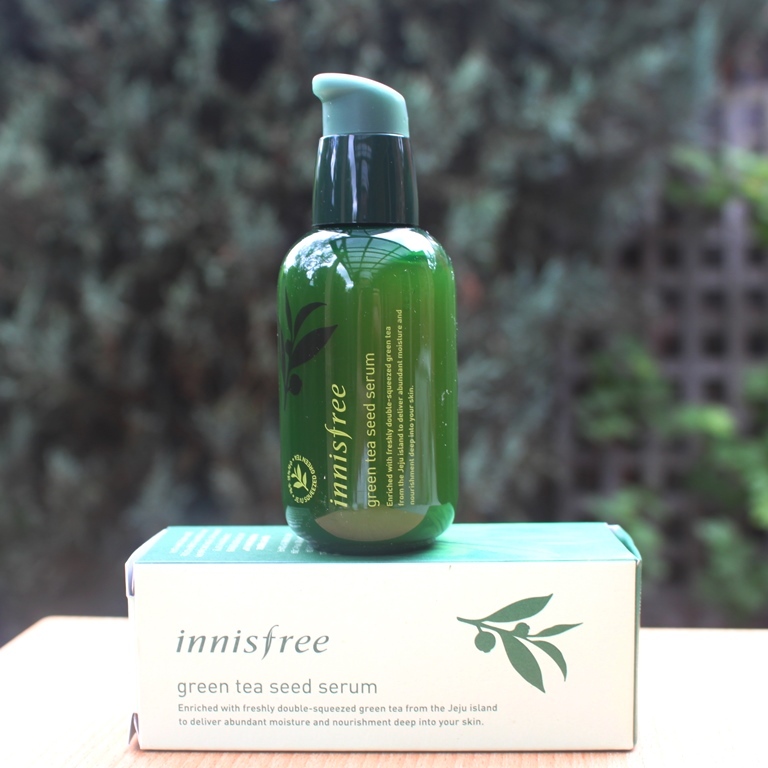 The Innisfree Green Tea Seed Serum is presented in a green tinted plastic bottle with a pump action dispenser. It comes with a protective cap to prevent accidental dispensing. 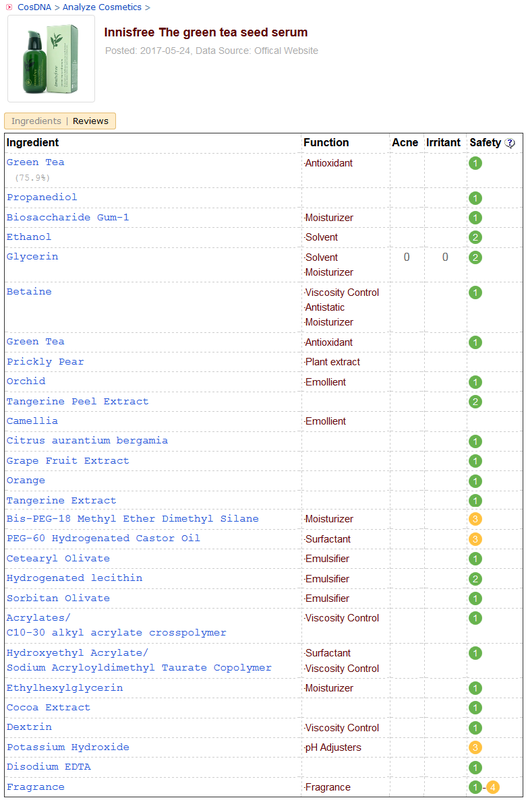 The CosDNA and EWG resources rate the Innisfree Green Tea Seed Serum a moderate hazard. 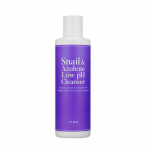 Apply an appropriate amount onto cleansed face and neck. Gently pat for increased absorption. 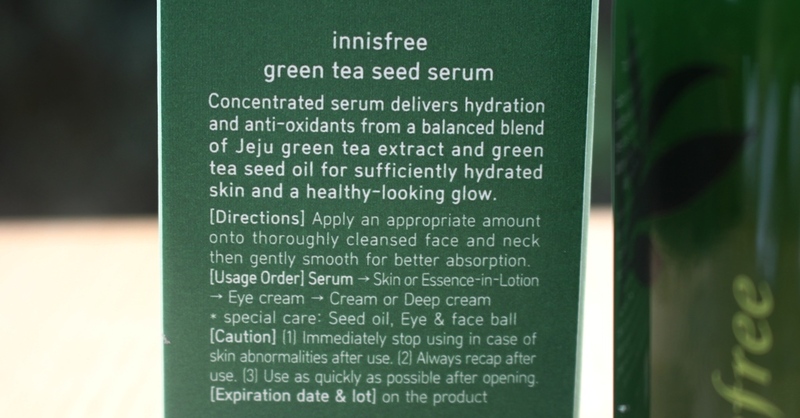 The Innisfree Green Tea Seed Serum has added fragrance. The 80ml bottle costs AUD$35.00. 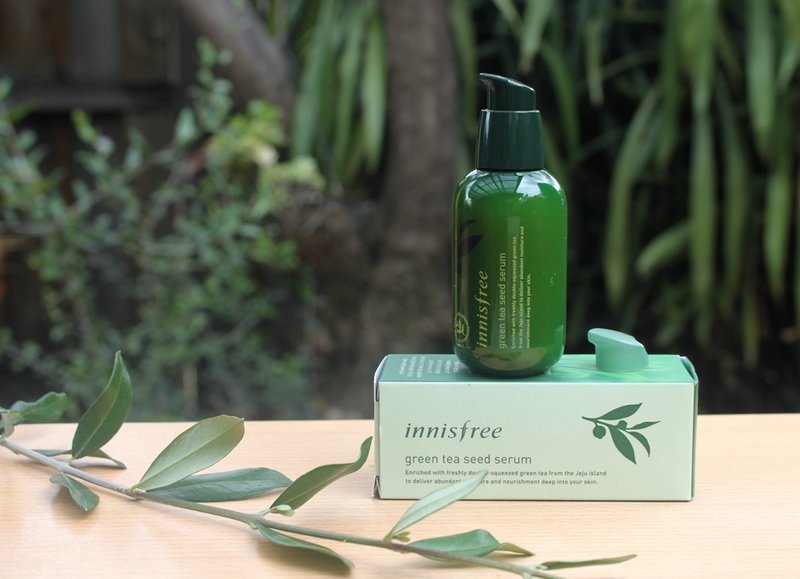 Innisfree products are available at Korean skincare boutiques including April & Ko and Style Korean. 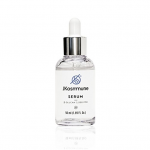 The serum appears to have a three year shelf life and must be used within 12 months of opening. This serum is nothing short of iconic. It is certainly the brand’s hero, confirmed by the fact it is their highest selling product. It is what Secret Essence is to Su:m37°. 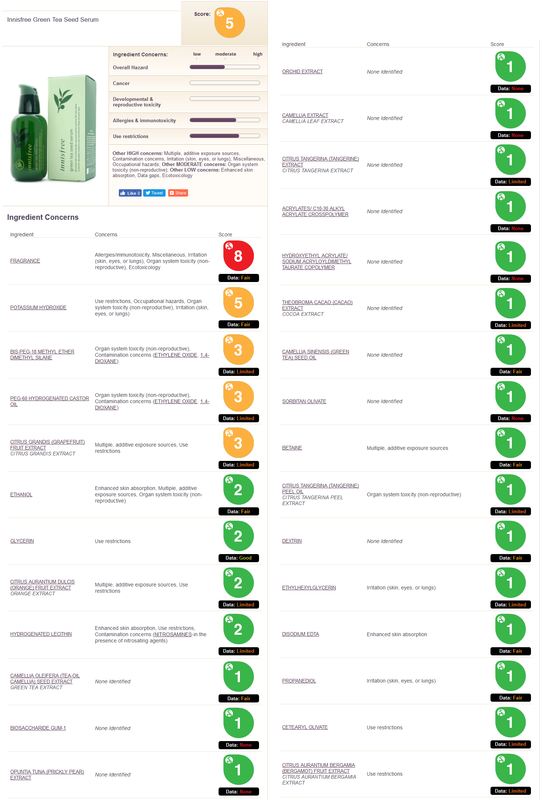 So, I approached this review with excitement to discover why it is such a popular product. 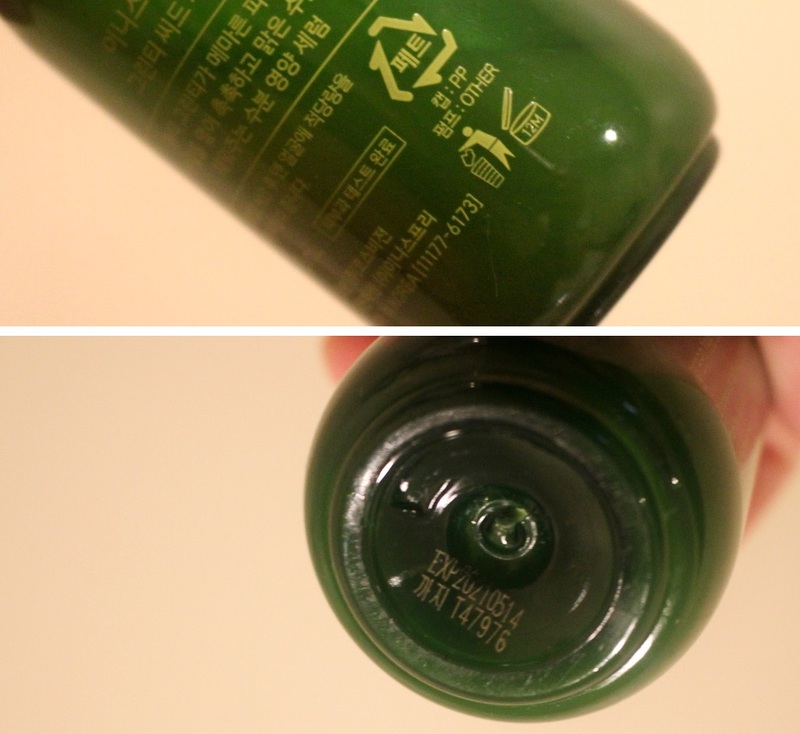 Firstly, the plastic, green tinted bottle is quickly recognisable and synonymous with the brand’s green tea line. It is aesthetically attractive and hygienically designed with a pump to dispense product with minimum risk of contamination. The small cap is effective at eliminating unintentional discharge without bulk. The serum is slightly viscous but still runny and a little cloudy in appearance. It has added fragrance which accounts for its fairly strong scent which to me smells floral with a hint of lemon. It doesn’t irritate me but together with the citrus extracts, may cause irritation to those with sensitive skin. Two pumps is plenty to cover face and neck, one and half probably the ideal amount required. It applies easily with plenty of slip, then absorbs quite quickly too. This is no doubt encouraged by a significiant amount of ethanol in the product, fourth on the INCI. I have been using it generously both day and night for almost two months and am nearly half way through the bottle. Liberal use sees this lasting 4-5 months but with more conservative application (maybe a single pump each time), it would probably endure 6-8 months. It is a generous 80ml, more than double most serums. 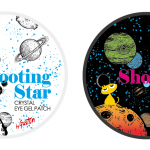 It has slipped into my routine easily and delivered good hydration, even with the drying effects of the alcohol. 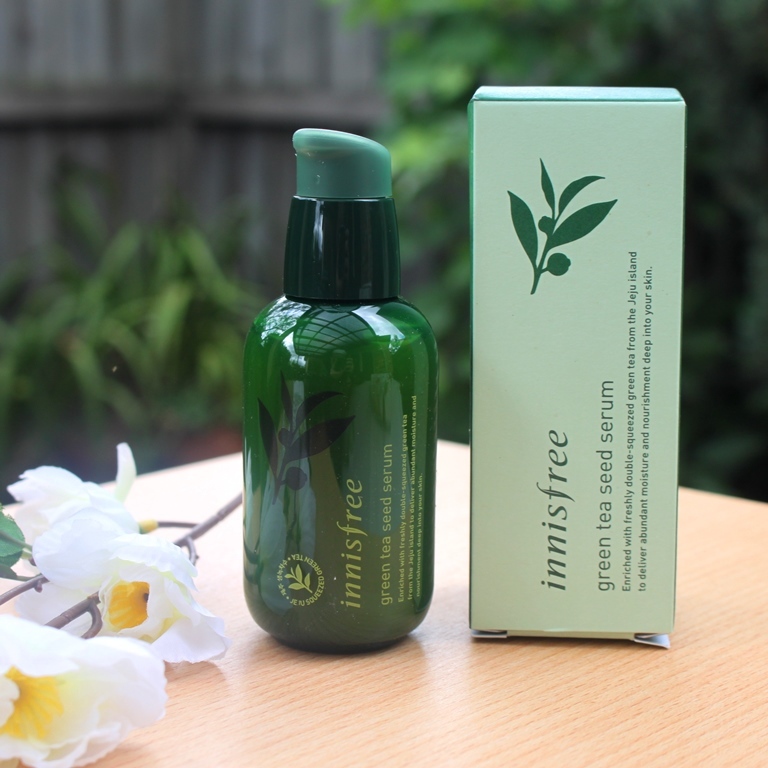 I’m a fan of prolonged topical use of green tea because of its antioxidant and anti-ageing benefits. I believe these can only be realised with consistent use over extended periods of time. 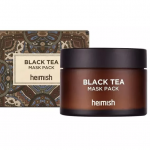 And this product packs a punch with three quarters of it derived from green tea. However, coupled with the alcohol in this serum, it raises concerns for the long term effects on the moisture barrier. There are certainly ingredients in the serum to strengthen the stratum corneum so perhaps combined with the alcohol, they just eliminate one another with no benefit or detriment?? However, I’m not convinced that alcohol (not sure of the percentage) can be totally balanced/nullified/counteracted by other nourishing ingredients. According to Paula Begoun, the damage starts the second alcohol touches the skin. This sort of damage can lead to irritation, redness, acne etc. because a compromised barrier is more susceptible to bacteria and environmental pollutants. 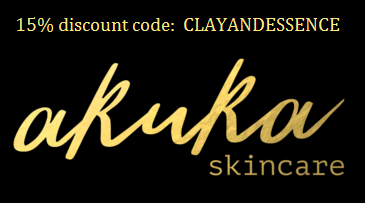 For the record, I haven’t observed any degradation to my skin while using this serum. I’m not scientifically qualified to make a final judgement but suffice to say, I am curious and cautious. So in summary, this serum is nice. 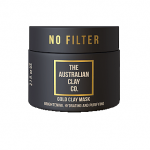 It hydrates and feels good on the skin. However, it is not unique in its ability to achieve this. 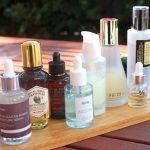 Many serums provide this benefit. The ethanol content is a concern although in the couple of months that I have been using it, it does not appear to have had any detrimental impact on my skin. I am not prepared to test its impact over the long term with extended use but am happy enough to finish the bottle. 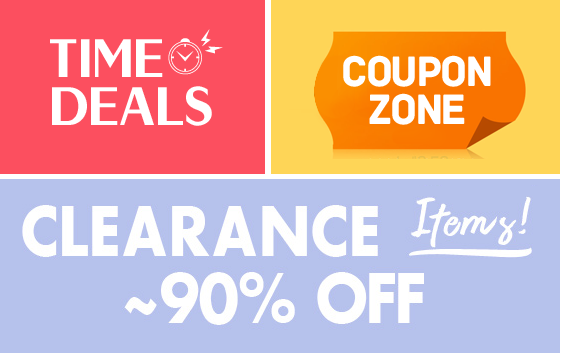 This product was provided to me free of charge by April & Ko for review. 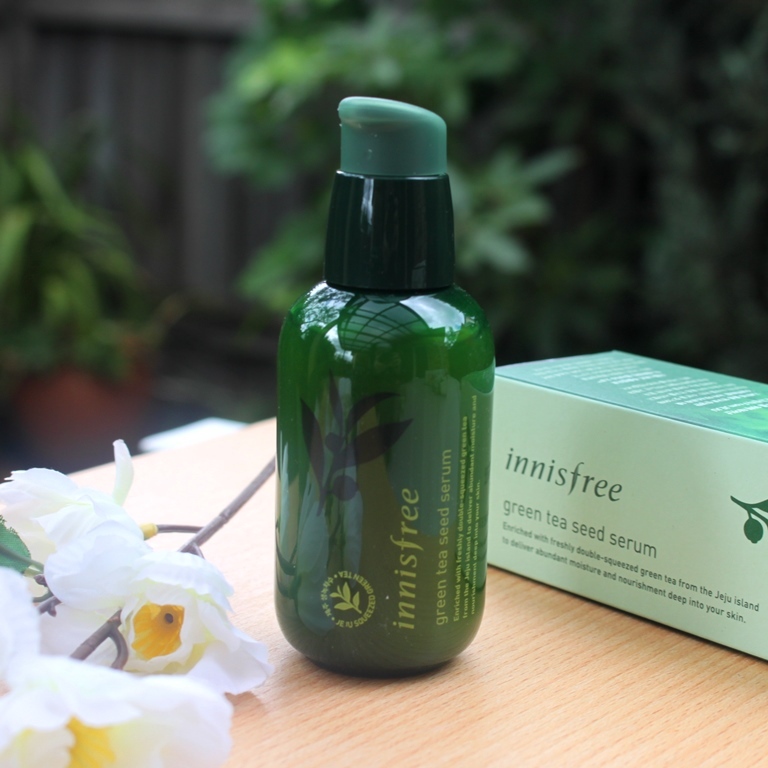 This post only includes my honest opinion and experience of this product and is in no way influenced by April & Ko, Innisfree or any of its representatives or any other third party.